computer featuring a water cooling system. In our pockets, we carry around devices that used to take the space of an entire room. They stay cool, or sufficiently cool to operate, even though we are processing massive amounts of data at our fingertips. AMD delivers these Wraith Coolers with selected CPUs. A computer generally has two components that need to be actively cooled. The first is the Central Processing Unit (CPU) which is present in all modern day computers (and handhelds). The second is the GPU, which is an optional extension that is required for heavy graphics work or gaming. It's important to keep these components cooled. They have an operating temperature which is considered 'safe' and will break above it. The components do feature safety features that will protect it, but throttle performance (thermal throttling). 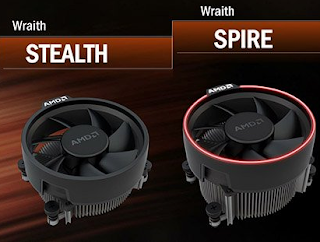 On the right, you can see the AMD Wraith coolers. These are rather simple; a heat sink and a fan. The heat generated by the CPU is conducted through the heat sink, which is just a piece of metal with a large surface area. There are two ways in which heat is removed from the heat sink. The first is simple radiation; any object emits a spectrum of electromagnetic radiation (light). In fact, acceptance of the explanation of that spectrum (the photon) is the first major impact of Albert Einstein and has led, when considered in reverse, to the rise of quantum mechanics. Computers, as an example of semiconductor technology, are the early results of quantum mechanics. Heat radiation is directly proportional to the area of the radiating surface and proportional to the temperature squared and squared again. The second is heat conduction. This is exactly the same as just putting your hand on a surface. The motion of the particles of the material is transmitted to the motion of the particles in your hand; for a heat sink, that motion is conducted to the air around it. That air heats up, which would be a bit pointless (it saturates). Therefore, a computer cooler adds a fan to move that hot air away from it. In more regular appliances, a room radiator would make use of hot air rising to passively have an air current that moves the heat away. The conducted heat is proportional to surface area and temperature difference between the two materials. For both methods, surface area is key: the more surface area there is, the more heat can be radiated and conducted away from it. This will heat up the air around it, so in computer use-cases fans are added to move the hot air away. But as you increase the surface area in a limited volume, the spacing between surfaces decreases. This requires more pressure to move the air through it, so that the static pressure (SP) becomes more important than the amount of airflow. Specialized fans exist for this use-case. cooler using same principle as a heat pipe. The design of the coolers above is considered rather basic. Because it is well-ventilated, heat dissipates as it moves up. As a result, there will be a change in the temperature of the heat sink as you move up throughout it. 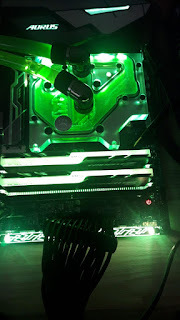 But that means that the efficiency of cooling is lower as you move up throughout the heat sink and that there is a point at which it isn't sensible to make the heat sink taller. But some CPUs simply generate more heat than others. This is called the Thermal Design Power (TDP) of the CPU. This power is measured in Watts. For comparison, a water cooker features a few thousand Watts. A small budget Intel i3-8400 features a TDP of 65W. My more expensive i7-8700K, stressed beyond its normal limits, features a TDP of 125W. The AMD Ryzen threadripper 1950X, by default, features a TDP of 180W. Compared to the water cooker, it doesn't seem like much. But it's focused on a far smaller area, of a few cm squared. If the efficiency of the heat sinks is limited, how can you account for triple the TDP? The answer lies in Heat Pipes. Heat pipes are very interesting devices in that they use full-blown thermodynamics to offer significantly higher heat conduction than a regular old copper block. A heat pipe is just a hollow piece of copper filled with some small amount of liquid. Here's the trick. As you know, water doesn't boil immediately when it reaches 100 degrees Celcius. Rather, it needs a bit more to make the transition to a gaseous state. This is called the latent heat. At the contact-area of the heat pipe, a small amount of liquid is present. As it heats up, the liquid boils. Its vapor expands, filling the pipe to the other side. At the other side, the heat pipe should be cooled. This allows the vapor to condense back into liquid and come down to the heated area again. The conductance this offers is incredible - about 250 times as much as a simple copper pipe (conductances of 100 kW/(m.K) versus 0.4kW/(m.K)). In the advanced Noctua NH-D12 cooler featured above, we see massive heat sinks. That's beyond the limit of simple conductance. Instead, the heat from the CPU is conducted by 12 heat pipes to the heat sinks. The heat sinks are then cooled by not one, but two high-pressure fans that are able to push the air through the tightly spaced heat sinks. For most videocards, the process works in the exact same way. The heat is conducted through tightly-spaced heat sinks by heat pipes and then the hot air is moved away efficiently by high-performance fans. Some videocards are 'blower style', which means their airflow is directed outward throughout the back. This is useful when space around the videocard is limited, which can be a concern. Most videocards just take air in the front and expel it all around it. to cool my own CPU. Computer building enthusiasts opt for a third option. Rather than using 'air coolers', they use liquid coolers. As we've learned, surface area is key. But the area around the CPU is limited; not only is your computer case only so big, but there are other components around the CPU. So, why not move the heat to some place where you do have the space? 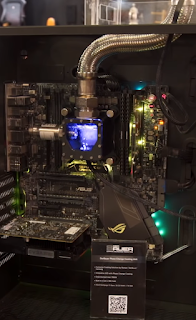 In Liquid Cooling, the idea is just that. A liquid is in contact with the CPU heat spreader and thus heated up. By pumping it around, you can move the heat away rather efficiently. Water has a significantly lower conductance than copper (0.6 W/(m.K) versus copper's 400). But that doesn't matter - as soon as the water is heated up, it is moved away. This keeps the efficiency of the heat conduction at peak performance, because it is proportional to the temperature difference. With a heat pipe, the fluid near the CPU will be near-boiling point at all times. This lowers the amount of heat conducted. With a fluid, it will reach some saturation temperature that is a few degrees above ambient temperature. Then, in the other place you can place one or more radiator to dissipate all that heat. The radiator in my computer has dimensions 400 x 130 x 60mm (L x W x H). It's about as big as a keyboard, but 6cm tall. It has a TDP of about 850W when the fans are spinning at full speed. 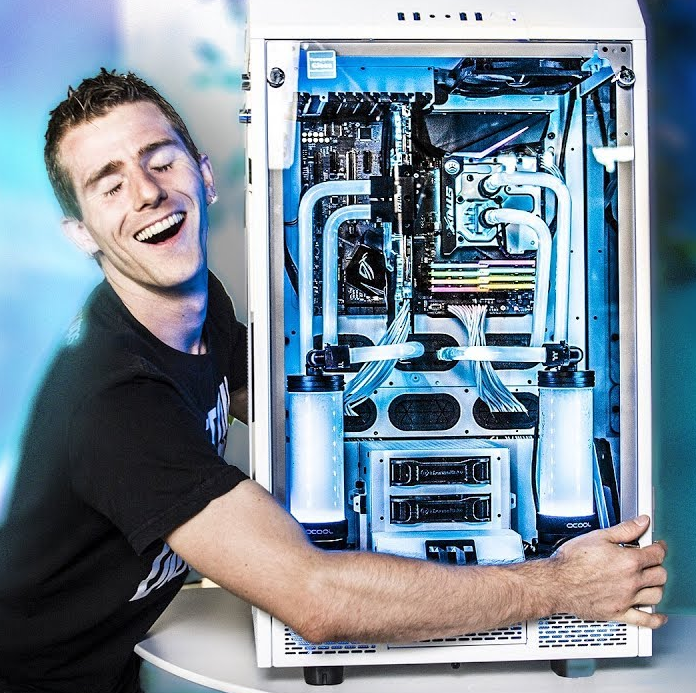 Enthusiast computer cases feature many places with space to place radiators. In laptops, space is the bigger concern. 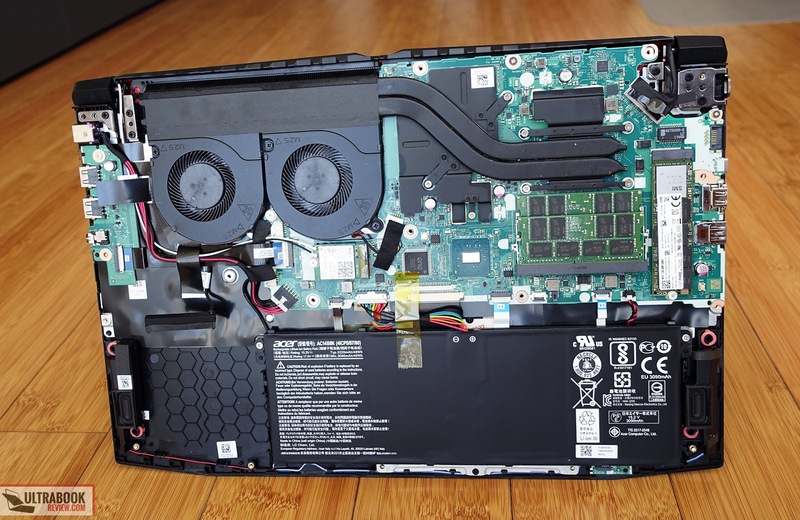 Laptops usually feature a well-thought out combination of airflow path, heat pipes, high-performance heat sinks and powerful fans. On the right, I've placed a few images of MSI's cooling solution. This solution would take in air from the bottom of the laptop and expel it at the back and sides of the laptop. We can clearly distinguish the principles we discussed earlier. In the center, we have the heat-producing CPU and GPU. Heat pipes conduct the heat away to massive heat sinks on the sides and back of the laptop. High-pressure fans expel air out through the heat sinks, moving away the heat. Generally, laptops feature components that have been slightly adjusted so that they produce less heat. 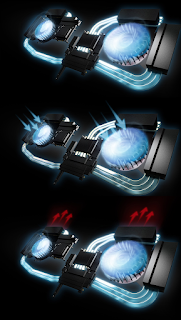 Their fans spin only slightly in normal use cases, but can be heard to spin up rapidly when load is applied. There are differences between laptops. The default is always pretty similar. Move heat from hotspots (cpu, gpu, chipset) to radiators using heat pipes, which exchange heat with air pushed through them using fans. There are differences, though - the new Razer Blade doesn't use heat pipes, but has a vapor chamber cooling system. As you now know, this essentially means they made a very big heat pipe! Another significant difference is the air intakes and exhausts of your laptop. The MSI cooler (Figure on the right) is pretty typical. There are exhausts with radiators around the screen hinge; two on the backside and two on the sides. Air intake is directly below the fans displayed. That sacrifices space which often is used for Input/Output (IO), so another typical version just has exhausts with radiators on the back. I really do suggest people take a look at the cooling of electronics before buying it. Consider a neat budget model like the Acer Nitro 5. It seemed like a really neat budget gaming laptop when I first saw a review of it. It also seems to have nice cooling: there is a large grill (exhaust) over the entire backside, which isn't chocked off by the hinge. Then there seem to be two small intakes on the front of the laptop, and a lot of air intake on the bottom. As you can see on the right, looks aren't everything. That dominating backside grill only has half of it covering a radiator. 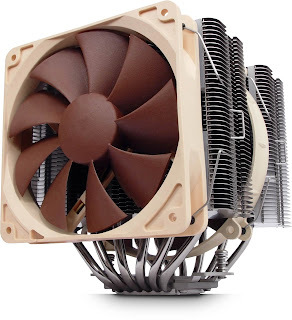 Less than half of the bottom intakes are actually near a fan. So it seems impressive, but actually turns out to be rather disappointing. It tells; the CPU is known to run hot under load, up to throttling. Other competitors (e.g. ASUS TUF Gaming FX504) in the space have twice the radiators, with fans spread out over the bottom - ultimately offering a significant increase in cooling. Smartphones don't usually come with fans, so clearly their cooling is passive. But how does it work? On the right is a Google Pixel 2XL. As you can see, it contains many parts. The second from the left is its motherboard plus things like the memory modules, processor, etc. That is where the heat will be generated. Also visible is that the backside of the screen is covered by a metal midframe. I wonder about this particular piece myself - it seems like it could work as a heat spreader - it takes the heat from the hot components and spreads it over its surface. This then allows for somewhat more effective dissipation of the heat as it uses a larger surface area. 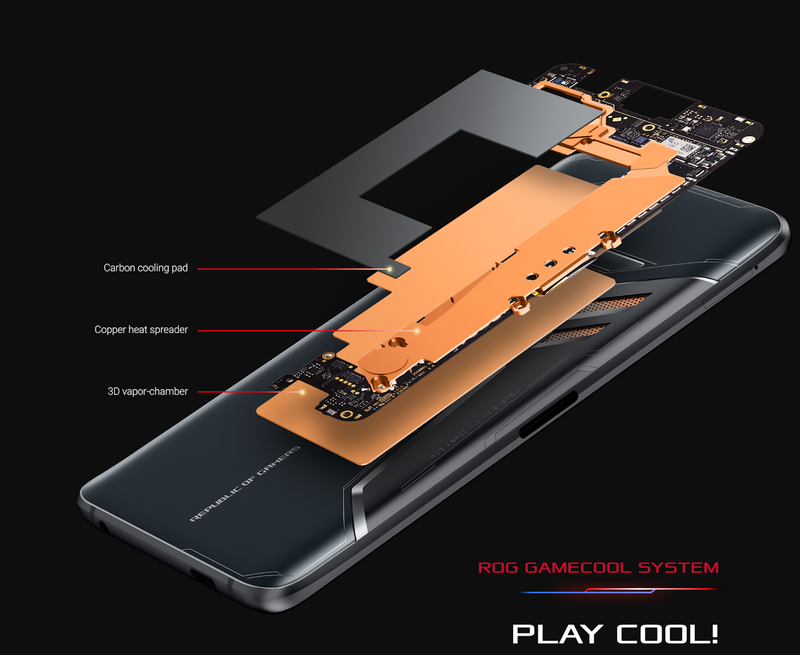 ASUS ROG phone cooling system. ASUS has made an attempt at a gaming phone. 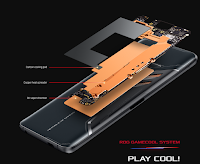 I won't go into details, but the phone also has the "exclusive GameCool system (which) features highly efficient 3D vapor-chamber cooling inside, enhanced with a copper heat spreader and carbon cooling pads on the circuit board for maximum cooling performance." By now, we are able to dissect what this means. Looking at the picture on the right, the vapor chamber wraps around the motherboard from the bottom. That indicates it function - it is a heat pipe. It contacts the copper heat spreader, which distributes the heat from the different components (due to the heat pipe, both from the top and bottom of the motherboard) around. The carbon cooling pad is a thermal interface, connecting the heat spreader to the metal frame. This is something smartphones and tablets often lack. ASUS offers an extra component that actually just blows air onto the metal frame atop this carbon cooling pad, thereby increasing the cooling greatly (effectively by just going from passive to active). For most phones, that wouldn't work - the heat doesn't go from the components to the metal frame. Thermodynamics is the engineering science that brought us the industrial revolution. In the post above, we've spoken of numerous principles used in everyday devices. I cannot think of anyone of our generations (in my case, millennial) that doesn't have one of these devices for daily use. The principles we've discussed here also apply for your car, your refrigerator or freezer, power generation and so many different feats of ingenuity that we barely think of them. I won't give you an exhaustive list, but I will refer you to a friend of mine's series on thermodynamics: first, second, and third. Be warned, his dive into thermodynamics is quite deep!